Michael Drosnin is an American journalist and author. He is best known for his writings on the Bible Codes. He was born on January 31st, 1946 in New York City. 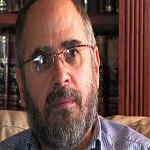 He began researching Bible codes in 1992 after meeting Eliyahu Rips. Later, in 1997, he published his book Bible Code. The book asserted that the Bible Code foretold many famous assassinations.